The answer is in the Italian approach to style and the art of putting all of it together. Here we’ll show you how to do it flawlessly. First off, Italians aren’t suckers for transient trends. Nor, are they stuck in the ways of old. Instead, we fuse the best of the two; blending contemporary colours, prints and textures with timeless silhouettes and details. Capisce? So let’s take a look at what it means to feel, and dress, like an Italian. You’re not Italian without something tailored. Separates, the jacket and/or trouser contingent of a traditional suit – are foundational items; oozing the Italian adage of balancing work, rest and play. For summer, a linen or cotton blazer in pastel hues or navy are pivotal. Winter can be a touch more sturdy with lustrous mohair or cashmere jacket, or one in a textural tweed. 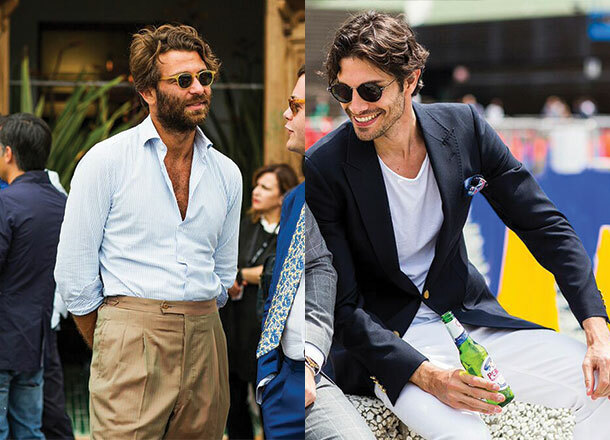 White trousers are a staple for the Italian male. They work as a neutral colour that balances a bold, colourful jacket, and give back a summer vibe, just by association. The Italian man wears the clothes, the clothes don’t wear the Italian. It is not essentially about brand, it is about style. A tailored jacket or blazer is a must, so it fits you like a glove. Then, there is the actual execution – avoiding a clumsy mimicking of an Italian look. The issue lies in appearing ‘owned’ by the clothes; usually indicated by an awkward styling. For instance, an overly matchy bow tie, boutonnière and pocket square combination or having multiple necklaces, rings and silver chains dripping from your frame. Italians don’t wear ‘things’ for the sake of it, so if you’re putting all the ‘right’ things on but it looks ‘wrong’, strip the accessories back and start again. Show those clothes who’s boss. Jackets and pants are essentially formal attire. But Italians wear these suit-ish items, regardless of the occasion. Dressing down traditional formalities is the secret. Pinstripes, micro-checks or all-black suits are typically super formal. But not when the jacket becomes unstructured – that is, softer on the shoulder and not cut quite so close to the body, like its structured brother. The padding and inner linings normally found in structured jackets are removed to give them a relaxed fit. Dressing the unstructured jacket is simple. Take a button shirt and leave the collar unbuttoned. Or go for a tee instead of an Oxford one all together. A woven silk tie is a great replacement for the more business, windsor style – and it gives back some much-loved texture to the flatness of a shirt. It wouldn’t be an Italian style piece without mentioning sprezzatura. Thrown about a lot by fashion types, the word describes a “certain nonchalance, so as to conceal all art and make whatever one does or say appear to be without effort and almost without any thought about it.” Sound easy? 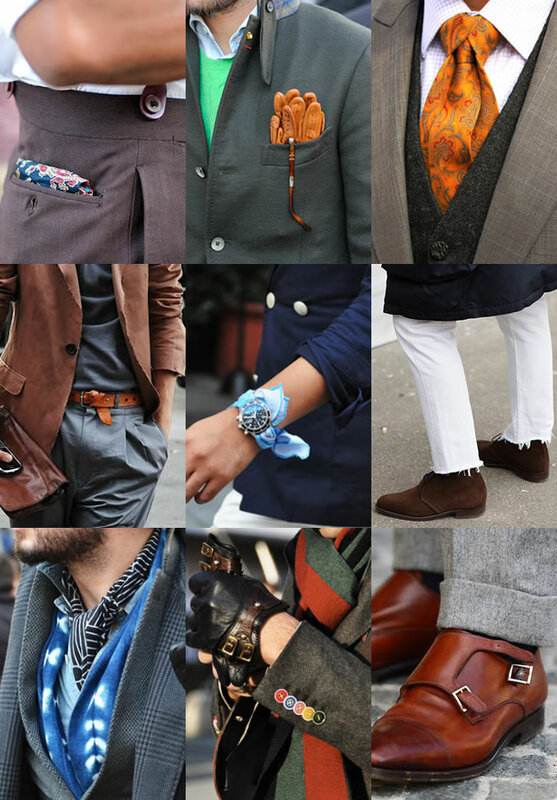 Essentially, sprezzatura is all in the styling. And looking like you haven’t tried. For instance, when wearing a belt try moving the buckle off-centre and then wrap the leftover leather around the belt itself. Or why not wear leather monk shoes with no socks and the buckles unfastened. Imperfect, yes. But perfectly, so. Both these add individuality to your look without destroying all your hard work. A blazer or jacket needs a collared shirt? Trousers should be worn with a belt? Shades are to be worn only when it’s sunny? Assolutamente, no. In the name of style, true Italians bend or even break, traditional fashion rules for the greater good of the outfit. But you have to know the rules in order to eloquently manipulate them; beating fashion at its own game. Breaking the rules in the name of style is the craft of the well dressed man. The Italian can tell simply by looking in the mirror that what he’s done say, with a looser tie knot or a half-tucking of a shirt, is a pure fashion crime – but it’s for good reason. The reason we buy so many clothes is that we don’t know what really suits us. Consequently, we are continually going shopping, caught up in an eternal hunt for the magic something that will transform us. But because we don’t really know what we should be looking for, we keep buying the wrong thing, or at least the not-good-enough thing. Well-dressed Italians, on the other hand, have a uniform and abide by certain sartorial rules, with the happy outcome we have all seen around us on our travels. Everywhere we look we see the jacket not fitted, the trouser too long, the shirt too loose… It is a shame. Once we know the rules and what we should be looking for, we will buy less – but better. We might spend more than we did before as our taste becomes more refined, but it will be on clothes we actually wear rather than leave on a hanger until condemning them to eBay or a charity shop. Beautiful clothes do cost more only because of the fabric used etc – but expensive fabric performs very differently from cheap fabric, and the outlay brings savings in the long run. Improving your look is an incredible help in life – and everyone can do it, whatever their budget. Please don’t think you have to buy expensive clothes, no, no, no! You can buy a nice jacket/blazer, shirt, or trouser at a price that suits you financially and take it to your tailor and have it fitted and taken in, to give that more expensive, quality look. This is such a great money-saving Twip (Twins Tips) and can save you a lot of money in the long run. So. The secret of Italian style is simple yet complex: fit, colour and fabric. Please, keep it easy, keep it clear, keep it simple. The first rule is to know your body. Dressing well means time in front of a full-length mirror. Stand, turn, sit and lie like a Velasquez painting in front of a mirror. Analyse and accept yourself, good points and the bad. Otherwise, you will be dressing something you don’t know. It will be like having a round table and buying a square cloth. It could be nice, but it also could not. The second rule is to restrict the colours you wear. “Italians wear just two at a time,” They buy only four: black, blue, brown and white. In winter, black is king; in summer, white is black. The third and most important rule is to pay close attention to fit. Make sure it shows off your body to the full potential and you feel amazing in it. But always remember… Self confidence is the best outfit!